Expect Two More ‘Paranormal Activity’ Movies!!! Paramount has greenlit a 5th ‘Paranormal Activity’ movie, which will be a direct sequel to the 4th one, which opened to decent numbers this weekend. Read my review HERE. That’s not it though. 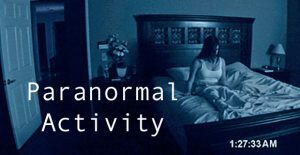 There will be a spin-off ‘Paranormal Activity’ film, which most likely come out next spring, geard towards a Latino audience. And if you have have seen the 4th film already and stayed to the very end of the credits, you’ll understand why. The 5th installment of the film will be out this time, next year, just like the previous films. Christopher Landon will write and direct the 5th movie. Lnadon wrote the 2007 film ‘Disturbia’, and is actually the son of Michael Landon. The Latino spin-off version will feature the same demon, but with an all Latin cast, and will most likely in Spanish. For those of you wondering, all of the ‘Paranormal Activity’ films have cost around $8 million dollars to make, and they have made a combines total so far of almost $600 million dollars. Horror is alive and well. Hopefully, Landon will bring a new spin to this, as it desperately needs it. Film Review: ‘Paranormal Activity: The Marked Ones’!! Film Review: ‘Paranormal Activity 4’!!! This entry was posted on Sunday, October 21st, 2012 at 5:39 pm	and is filed under Film, News. You can follow any responses to this entry through the RSS 2.0 feed. You can skip to the end and leave a response. Pinging is currently not allowed. « Behold!!! A glimpse of the ‘Iron Man 3’ Trailer!! !